On my way home from work today I took a detour by Broadway to do some shopping. Two of the most loveable persons are getting married once I get home so I need everything ready for that. Shopping is exhausting and it adds on with a laptop in your bag. Planned to bring thai food home and pass out in my bed but when I got to the restaurant I decided to stay there and get some new energy instead. Bodhi Tree (10th street, 3rd ave) is a relatively small and nice decorated place in The East Village. Every Monday and Tuesday they have a special menu where you get 2 appetizers and 1 main for $10. Really good value and I wasn’t the only one with that thought – the restaurant was packed but I got a table straight away! Service was kind of slow and I waited at least 10 minutes before I could even order tap water. From the menu I chose Chicken Satay and Thai Salad as starters and a classic Pad Thai as main. Once again I waited surprisingly long for the food (thai places are normally so fast!) and once it came I got all 3 dishes at the same time. The chicken satay was a favourite from the start. The chicken was really tender and SO full of flavour. Good flavour! The salad also came with satay sauce, which is a good sauce but would have been more interesting with something else. 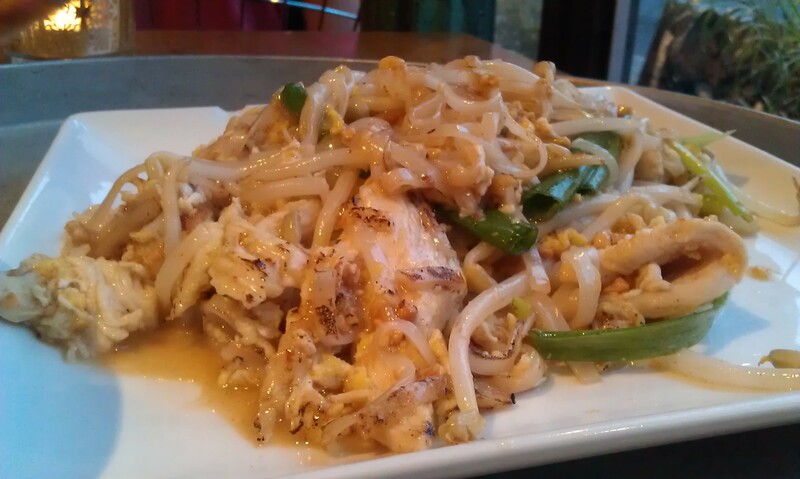 The Pad Thai was a winner, quite plain but rich and fresh in taste which I liked. Sometimes it can almost taste a bit artificial. I can really recommend Bodhi Tree. Go here in the beginning of the week and get really good value for your money! NOW – It’s finally time to pass out in my bed!